Hello everyone, just met up with a friend for dinner and the topic of CPF came up. Before we head furthur, let me attempt to explain briefly what is CPF. CPF = Central Provident Fund. It is Singapore's social security system, something like America's 401k plan but not exactly the same. If you are a working Singaporean, every month a portion of your salary will go into CPF + employer will add contributions too. The contributions will be allocated to 3 accounts namely Ordinary Account, Special Account and Medisave Account. *Extra interest of 1% is paid on the first $60,000 of your combined balance, including up to $20,000 from your Ordinary Account. 1. We must understand that the 2.5% interest by CPF is guaranteed - Would you be confident to find an investment return of at least 2.5%? 2. The capital is protected (unless the govt collapses which is highly unlikely) - Would you be confident that your investment will turn bad? Unnecessary stress when retirement money is at stake. 4. In the event that we require money in our OA and have to liquidate the investment, we would not be in control of the price that we are selling. If the economy is in a recession and we sell, lagi worst. The only exception where I might invest using CPF money is during a huge recession like the one in 2008/09. What I would do will be to set aside a certain amount of money in my OA (eg emergency fund for mortgage payment, going to buy a house). 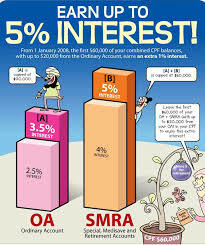 The excess money in my OA I would transfer to my SA which would gain a higher interest of 4% - 5%! With this I have a piece of mind of not worrying about my capital being at stake and yet have higher return rate. We should ask ourselves whats the intention of the CPF. If we want to grow your money faster, invest in a portfolio - creating passive income, that is also another source of retirement. I would not risk investing my CPF money because I would treat CPF as a last safety net. Thanks for reading. Do share with me your opinions and comments if any.